PTFE coated fiberglass thread is made from continuous fiberglass filaments that are heat resistant, chemical resistant, and strong. The fiberglass is also coated with a PTFE, a.k.a Teflon (tm) finish to improve sewability, and reduce friction. PTFE Coated Fiberglass Thread is mostly used in dry filtration and insulation applications. The fiberglass has excellent thermal stability, and can withstand operating temperatures to around 1022 F (550 C). It is important to note the PTFE coating burns away at 620 F (320 C). This means the coating will propagate flame, but the fiberglass will have a higher resistance to flame. PTFE coated fiberglass thread is usually used for filter bags, insulation jackets, heat shields, spray shields, high temperature gaskets and seals, high heat composites, and welding blankets. We sell PTFE coated fiberglass thread in three sizes or thicknesses. The most commonly used size standard is the Ticket (TKT) size. This table shows its basic specifications. Apparel and Melting Properties - PTFE coated fiberglass thread is usually too thick for safety Apparel. Also, the fiberglass may irritate skin. For heat resistant safety apparel, Fire Retardant Sewing Thread is the better choice. It has a broader color selection, and wider variety of sizes. While PTFE coated fiberglass thread can withstand higher temperatures, it will melt when it reaches its temperature threshold. When it melts, it sticks to the skin. When Kevlar, Nomex or fire retardant thread reach their thresholds, they turn to ash and crumble without melting or sticking. Strength - Size for size, PTFE coated fiberglass thread has about half the strength of Kevlar Thread. No Medical Devices - Our PTFE thread is clean in the ordinary sense. But, it is not sterile and using it in any medical device could put lives at risk. We will not knowingly sell PTFE thread for use in medical devices. PTFE and Tobacco - PTFE coated fiberglass thread should not be used in tobacco processing. Tobacco users should wash areas that come in contact with PTFE coated fiberglass thread before using tobacco. Also, tobacco products should not come in to contact with PTFE particulates. Color - PTFE coated fiberglass thread is not usually purchased for its color. The natural color of PTFE coated fiberglass thread runs from being a dark beige to brown and can vary widely from lot to lot. Texture - PTFE coated fiberglass thread has a very slick texture. It is also manufactured with a heavier lube than most other types of thread. This sometimes lends its self to feeling greasy. When this occurs, it will be shipped separately if other types of thread are ordered along with it. It is also important to note that when this occurs, we might need to discontinue in-house winding occasionally, due to machine limitations. Packaging - PTFE coated fiberglass thread is heavier and more dense than other industrial and fire retardant types of thread. 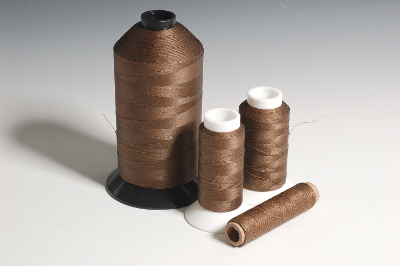 For example, we wind our nylon thread on to spools that are about 2.5 inches at the base, and 4 inches high. A 4 ounce spool of size 138 (Tex 135) nylon thread wound on to this spool will hold 750 yards comfortably, and will come close to covering the base of the spool. 750 yards of size 12 (Tex 135) PTFE coated fiberglass thread will cover around half of the surface area on the same spool. This means we can usually wind it to 8 ounces on the same type spool.